As a festival we want to tread as carefully as we can. We were pleased to win A Greener Festival Award this year and we’re on a journey towards making sure we do the best we possibly can to minimise our environmental impact and look after this good earth of ours, our Common Home. 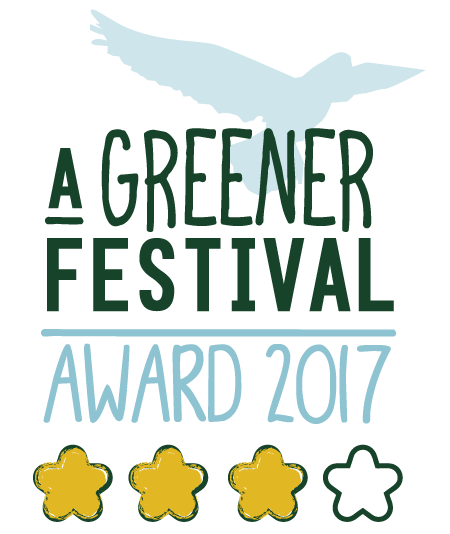 Working with A Greener Festival’s standards and goals, each year we measure an aspect of our impact in as much detail as we are able. Last year we looked at the our recycling rates in fine detail and this year we’re measuring our energy consumption across site, counting every last drop of fuel we use to run our generators. All we learn feeds into changes to the way we do things so that we can lessen our environmental impact. 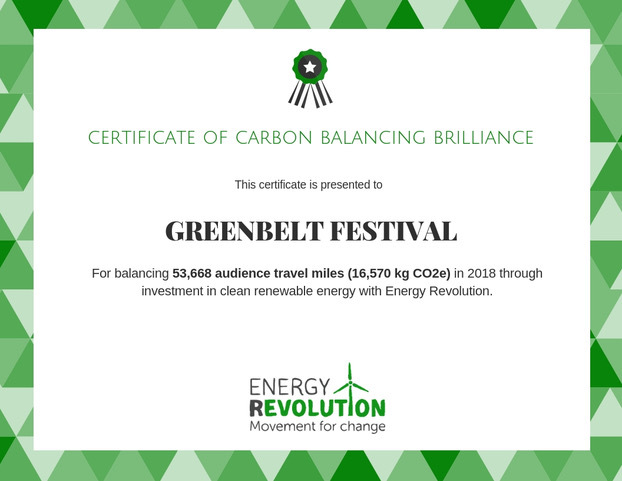 We partner with Energy Revolution, a charity that crowdsources donations from festival-goers and uses them to invest in sustainable energy projects. They turn fossil-fuel travel miles into clean, renewable energy. The biggest contributor of carbon emissions at festivals is usually travel, which can make up 60-80% of a festival’s carbon footprint. For a festival of 10,000 people, that’s a massive 120 tonnes of carbon dioxide. To have the biggest impact on carbon emissions, we have to tackle travel. Energy Revolution recommends a donation of £3 for a typical festival journey of 150 miles. You’ll be given the option to add this when you book your ticket. If you’d like to calculate the exact emissions of your journey, you can use this travel carbon calculator. If you have a re-usable water bottle or coffee cup then please re-fill it, and if you don’t have one you can buy them from the G-Store. In 2017 we removed all plastic cups, cutlery and food packaging from the festival. In 2018 we went one step further and removed all single use plastic bottles from the festival and encouraged festivalgoers to bring their own re-usable bottle from home. We’ll be continuing this in 2019. 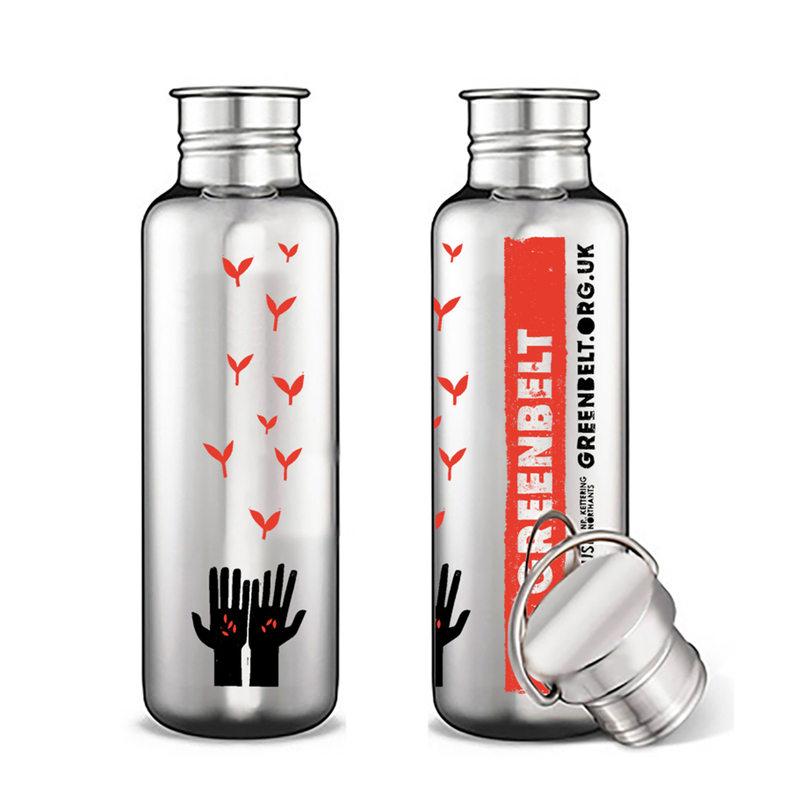 If you don’t have a water bottle we will be producing Greenbelt water bottles again to pre order. Sign up to our newsletter to be first to hear when we put them on-sale. Pay a £2 deposit for your Green Cup when you buy your first drink in the Jesus Arms or Blue Nun. Then, use that same cup all evening (or all festival!) for refills, or swap it for a clean one with your next drink. Whichever you decide, when you give back your cup, you’ll get your £2 deposit back. As we all know, rubbish and waste is a huge global issue. We’re always hearing about overflowing landfill sites and waste polluting our natural environment. While festivals are small compared to the global waste picture, they can have a huge impact by educating the people who come to them. 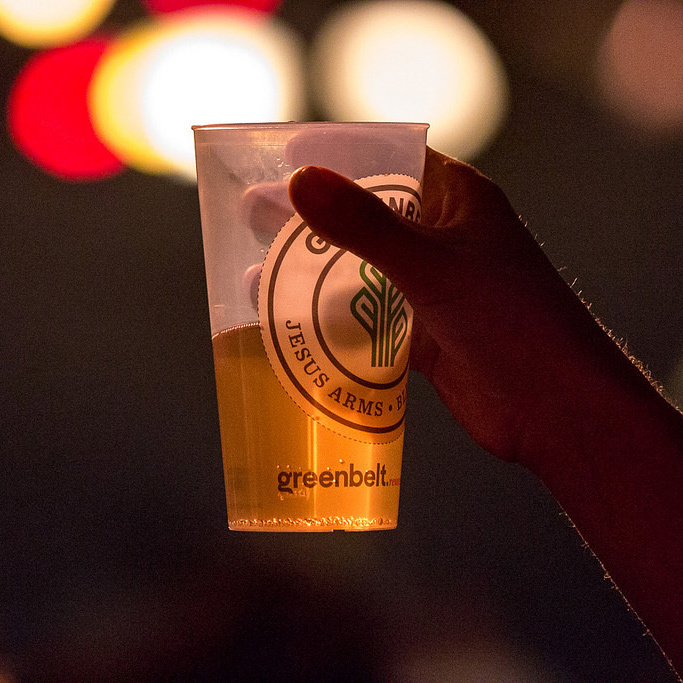 At Greenbelt we try to recycle as much waste as we possibly can. But we need your help. Think about what you’re bringing. Are you tempted to buy cheap and cheerful camping equipment? It’s much more cost effective and environmentally friendly to invest in quality gear that will last for many years (and festivals). 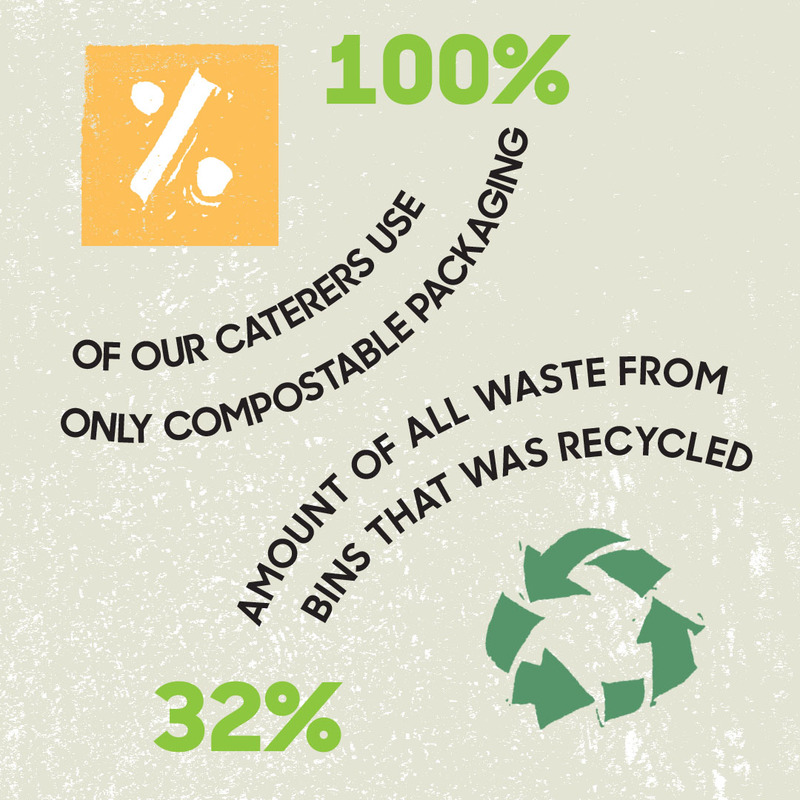 This year all the cups, plates, containers and cutlery you get with your food onsite are compostable — so you can put them, and any uneaten food or drinks, straight into our new food waste bins. All the recycling bins are clearly labelled with what they’re for. Make sure you put your waste in the correct bins. Please sort your campsite waste, too (using bags from the utility points). There are large pens throughout the campsite for you to leave rubbish and recycling. You can also get colour coded bags there to collect your waste. • Green bags are for recycling: cans, plastic bottles, paper and card. • Black bags are for rubbish that can’t be recycled. Please use the bags and the pens throughout the weekend – but especially when you pack up to go home. 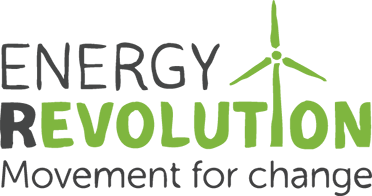 It makes it much easier for our team to collect and recycle your waste properly. Rather than taking home tins of beans you haven’t used, why not donate your spare long-life food to the local Kettering Foodbank? You can drop donations off at the Campsite Office from Monday lunchtime until 11am on Tuesday. Please leave the site as you find it. Take all your rubbish and belongings with you. 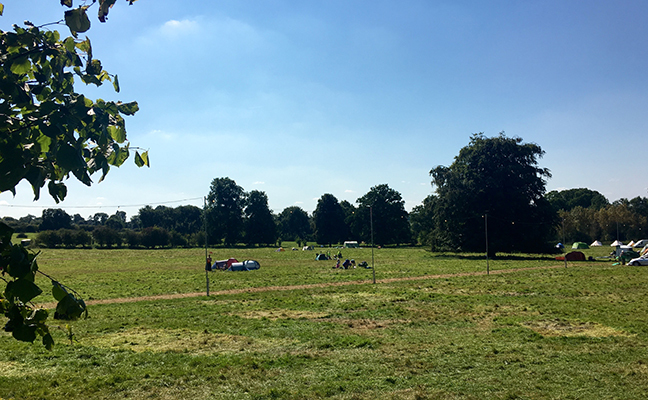 We’re proud of how pristine you leave the site (this photo was taken on the Tuesday afternoon just after the festival had finished on the Bank Holiday Monday last year!). Boughton love it too. We think we’re the tidiest festival on the planet. Please help us keep it that way. Our main pre-erected tent contractor are Camplight. Gutted at the devastation they saw left behind at large-scale festivals, they set out to reclaim and recondition the best tents left behind by festivalgoers and to give them another life by renting them out again and continuing to look after and repair them. We like this. Go Car Share is a great way to get a lift to the festival if you haven’t got a car or to combine with people in your area to reduce the amount of vehicles you bring to the festival. It’s dead easy to use and reducing the number of car journeys to the festival is the primary way in which we can reduce our environmental impact. For those choosing to come by train, the site is only a few miles from Kettering train Station and we run a shuttle bus service all across the weekend from station to site. And for those intrepid explorers arriving by bike, there will be places to lock your bicycles up. Every year, we bring great speakers to the festival to inspire and provoke us to take more action to combat climate change. In 2017, we’ll be welcoming Green Party politician Natalie Bennett from Sheffield and also Archbishop Dr Winston Halapua from Polynesia, fighting the effects of seal level rises caused by global warming in his south sea parish. 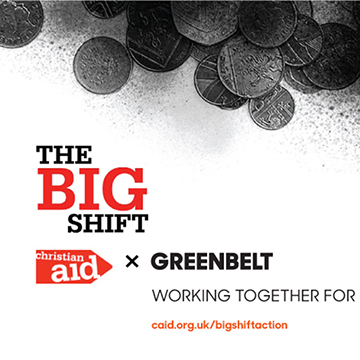 We’ll also be campaigning together with Christian Aid on The Big Bank Shift to get the four High Street Banks to plan to disinvest from fossil fuels and into renewables. As well as working with our partners Christian Aid around climate change advocacy and campaigning, we’re also developing new links with organisations like Coop Energy (with us at Greenbelt for the first time this year as part of The Exchange venue). Over the coming years we will be seeking to forge alliances with more organisations working for a greener, more sustainable future.